The, eventually, positive tone from the US markets were helpful for the Asian opening. However, talk that China and the USA are progressing on the trade talks was really what gave the whole region confidence. All core opened well with little sign of looking back. It was only the Shanghai index that lost momentum towards the close, but a healthy bounce back and it too closed +0.3% higher. The Nikkei was the star of the show gaining over 2%. As an exporting country, confidence that the trade conflicts were easing and a weakening Yen (-0.25%) helped boost domestic buyers chase bargains. Much of the advances were led by the auto’s sector following President Trump tweet of Tuesday and China coordinated response. The Australian AO and Indian SENSEX saw very similar trading patterns with both markets advancing all day. Closing +1.4% and +1.75 respectively indicates just how closely these markets are connected. More Yen and INR weakness is expected early for 2019. European bourses traded higher as the day wore on, despite all of the shenanigans and rumours coming from the UK markets. By the time the US opened, all core European markets were trading close to 1% higher, mostly constructive following Asia. Europe spent much of the afternoon watching the shambles materialising from the UK Parliament. The news that Theresa May faced a confidence vote this evening saw Sterling spike. The talk was that she would win the vote and the hope upon that result is she could then be more assertive with the BREXIT package. We also heard that Deutsche Bank and Commerzbank are to work on a possible merger and the talk is will government assist. Both parties shares rallied over 5% having been up over 7% at one stage. Guess its easier to bail out one, rather than two! The late result of the vote of Conservative MP’s was in favour of retaining Theresa May as PM (200 against 117). However, this obviously does not resolve the BREXIT debate and just ignites the hard-line Tory BREXITEERS to raise the fight even more. US futures markets were already strong and were expecting cash to open around 300point higher. News that US and China were starting to make some significant headway, supported all sectors but in particular auto’s and technology. The DOW did add nearly 500 points at one stage, but drifted into the close. News late that China is keen to open its markets even more was met with the CNH (off-shore currency) being hit and a small bid returning for the Yen. 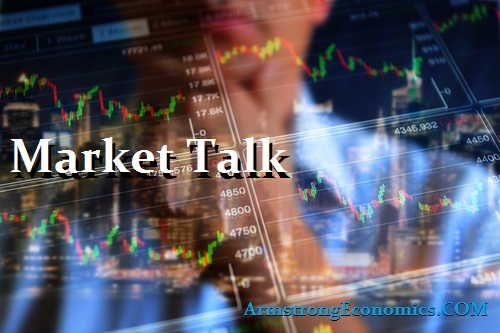 Back to basics and we still have the FED and some inflation numbers to wait for, but tonight’s Asian session is likely to follow the positive news being shared between US and China. The strong equity markets are seeing investors flee the bond market although the sole European buyer remains – for the moment. Japan 0.04%, US 2’s closed 2.77% (u/c), US 10’s 2.91% (+3bp), US 30’s 3.15% (+2bp), Bunds 0.28% (+5bp), France 0.73% (+2bp), Turkey 17.50% (-53bp), Greece 4.23% (u/c), Portugal 1.71% (-4bp), Spain 1.42% (-1bp) and Gilts 1.27% (+9bp). Gilt market is concerned the government is voting itself out of office and starts to price the possibility of a Labour government.